As the pioneer of photo reviews, we have been successfully creating reputations for our clients since 2010. No matter the industry, your business needs terrific online reviews and satisfied customers sharing their great experiences with friends and family about you on Facebook, Twitter, Pinterest, Google Plus and via email. So we asked ourselves, how can we get more customers to leave you online reviews and at the same time, be excited to spread news of your business throughout their social media networks? Snap21 is a simple-to-use product which will yield you immediate results. In fact, Snap21 is cumulatively capturing reviews from 4 out of 10 customers. How many happy customers go through your doors every day? Online shoppers relate to Snap21’s photo reviews on a different level. 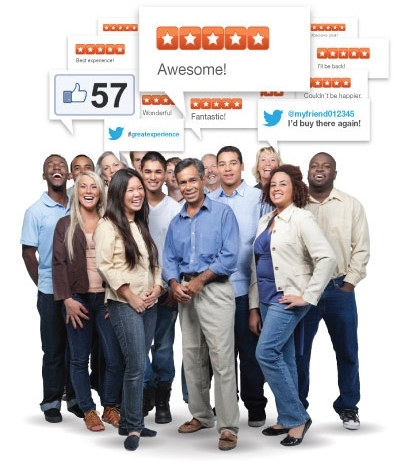 Each review is accompanied by a picture of the customer, so when people read them, they know they're real!